In October 1987 after many months on the road, it was in the elevated surroundings of the hillside open-air theatre at Lycabettus overlooking Athens that the So tour came to a climactic close. 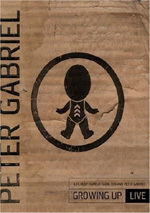 The three nights were filmed in what was the first-ever Peter Gabriel concert to be committed to film. As a concert film, it was brilliantly shot and has now been equally brilliantly remastered, a crystal-clear record of Gabriel and band in their mid-80s pomp. The viewer is placed right in the heart of the action all the way, from the band's synchronized choreography on opening number "This Is The Picture", right through to the skin-pricking closer "Biko". In between, we're lost in music, spellbound by the spectacle, totally absorbed by the imperfection-free tightness of a band that's been on the road for so long. Over the decade following his departure from Genesis in 1975, Peter Gabriel enjoyed a nice little career as a cult artist in the US. While he sold much better in the UK, Gabriel didn’t manage much chart success in America, as only two albums and one single managed to crack the top 30 here. Still, he was respected and maintained a decent base of fans who adored him. All that changed with 1986’s So. Buoyed by the massive success of the chart-topping single “Sledgehammer”, So went to number two in the US and sold more than five million copies. It made Gabriel a major mainstream artist – for good or for bad. Any discussion of how So changed Gabriel’s career trajectory should probably come elsewhere, as this article will examine his work in the immediate aftermath of its release. 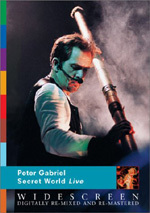 A concert video called Live In Athens 1987 comes from a show on the So tour and finds Gabriel toward the end of the yearlong trek in support of the album. Of the program’s 16 songs, five come from So itself: “This Is the Picture (Excellent Birds)”, “Sledgehammer”, “Don’t Give Up”, “Mercy Street” and “In Your Eyes”. From Gabriel’s 1977 self-titled album, we find “Solsbury Hill” and “Here Comes the Floor”. 1978’s self-titled release provides nothing but we get five tracks from 1980’s self-titled record: “Family Snapshot”, “Intruder”, “Games Without Frontiers”, “No Self Control” and “Biko”. Finally, four tunes appear from 1982’s self-titled platter, which the label – annoyed by three straight albums named Peter Gabriel - called Security in the US: “Shock the Monkey”, “San Jacinto”, “The Family and the Fishing Net” and “Lay Your Hands on Me”. Like many, I hadn’t taken much notice of Gabriel before 1986, as I knew “Shock the Monkey” and that was about it. I actually saw Gabriel play live in June 1986 as part of the daylong Amnesty International benefit show at Giants Stadium, but I remember nothing of his performance; I was there for U2 and the Police, so Gabriel slipped under my radar. He made a much bigger impression on me less than a year after the Athens show on this disc, though, when I went to Philadelphia for another long Amnesty benefit concert. Drawn by Bruce Springsteen and Sting, I left the venue a Gabriel fan, as he provided the best performance of the day. Because the 1988 show came well after the finish of the So tour, though, I’d have to wait until 1993 to see Pete headline a concert. Because Athens comes from the era that sparked my interest in Gabriel, I was definitely curious to give it a look. Going back to his Genesis days, Gabriel always innovated on stage and tended toward heavily visual performances. That remains true for Athens, where Gabriel reminds us what a magnetic frontman he can be. While theatrical at times, Athens lacks the wild costumes of Gabriel’s Genesis performances or the extravagant staging found in his later tours. That said, it’s still a strongly visual show, as the lighting and Gabriel’s antics ensure that we always have a compelling reason to keep our eyes on the screen. Gabriel walks a fine line as a stage performer. He plays his songs in such a broad way that he threatens to enter the realm of camp and melodrama. However, he avoids self-conscious irony and uses his behavior to embellish the songs rather than distract from them. Given his lack of standard frontman talents – Pete can’t dance – Gabriel’s ability to become such a great on-stage presence remains fairly remarkable. At the start of Athens, I feared that director Michael Chapman would clutter the program with unnecessary elements. Rather than focus on stage for “This Is The Picture”, we see a lot of backstage footage, so I worried that this trend would continue and we’d not get a good feel for the actual concert. Happily, that doesn’t become the case, as the rest of the program stays on stage where it belongs. While many concert videos opt for stylized visuals and rapid editing, Athens shows a delightfully restrained approach to the material. It gives us a clear, logical view of the concert and lets us feel like we understand what happened on stage. It doesn’t frustrate with odd, perplexing angles/shots; instead, it makes sure that we get a concise impression of the performance. Which is refreshing, given the number of borderline unwatchable concert films on the market. With a nice set list, a good performance and a vivid visual presentation, Athens becomes a strong program. 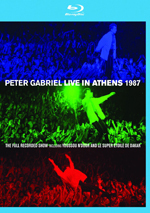 Peter Gabriel: Live in Athens 1987 appears in an aspect ratio of approximately 1.78:1 on this Blu-Ray Disc. About that aspect ratio: does it represent the original photography? I don’t know. While shot with a home video market in mind – and an ensuing “original aspect ratio” of 1.33:1 on VHS – the program used 35mm photography and may have been “protected” for a wider ratio. If anyone has heard comments from those involved about the “preferred” ratio, I’d be curious to learn the details. Viewing the program now, I can’t say that I saw any obvious artifacts of cropping from 1.33:1 down to 1.78:1, so if the presentation lost information, it didn't appear clear to me. Whatever ratio questions exist, the Blu-ray undoubtedly offered the highest quality of visuals. Indeed, the use of the 35mm photography made this easily one of the most attractive 1980s concert presentations on the market. Sharpness mostly seemed solid. Occasionally, wide shots came across as a little soft and ill defined. However, those examples appeared infrequently and did little to distract from the rest of the presentation, which usually looked concise and detailed. I noticed no issues with jagged edges or moiré effects, and I also detected no signs of edge enhancement. Source flaws looked absent. Most of the color variation came from lighting, as Gabriel and band tended toward white and black garb. Heck, even the colored lights remained fairly restricted; this wasn’t a monochromatic affair, but it lacked many prominent colors. Within those confines, though, the hues looked well developed and accurate. Blacks were deep and dense, while low-light shots came across as clear and appropriately visible. Athens looked quite good and was substantially more appealing than I’d anticipated. As one expects from a concert presentation, the DTS-HD MA 5.1 soundfield focused on the front, where the elements showed strong stereo imaging. Pete’s vocals appeared set in the middle, while the instruments were accurately located and they demonstrated nice breadth and delineation. I could distinguish the various instruments with ease, as they were placed in a natural and clear manner. They also blended together smoothly to create a forward soundstage that consistently created a real and involving setting. As for the surrounds, they broadened to a reasonable degree. While they didn’t include much unique audio, they embellished the forward channels in an enveloping way. For instance, during “Intruder”, the back speakers offered an eerie reverb for Gabriel’s vocals. We also got the usual crowd noise from the surrounds. They weren’t dynamic partners, but they suited the style of the program. Audio quality was solid – in a manner of speaking. On the surface, the show sounded great, and that was a problem, as it often didn’t sound “live”. I strongly suspect that significant portions of the 1987 concert were re-recorded in the studio, especially in regard to Gabriel’s vocals, which rarely – if ever – seemed “live”. These frequently displayed a heavy studio feel and I’d be shocked to learn that many came from that night in 1987. They did vary somewhat, as some songs sounded more “real” than others. “The Family and the Fishing Net” and “Lay Your Hands On Me” actually left the impression they might’ve been recorded live, but “Mercy Street” seemed so canned that it felt like I was watching a music video with the studio version slapped on top. The situation improved as the show progressed, so the majority of the “fake-sounding” vocals appeared in the concert’s first half; I remained suspicious of later singing too, but at least these elements blended better with the setting. It was tougher to judge the genesis – ha! – of the instruments. Those also tended to seem a bit too clean, but I bought them as “live” much more easily than I did the vocals. I suspect studio reworking occurred with the instruments as well, but it seemed much less glaring. This became a substantial distraction for me, as I couldn’t quite get into the performances as much as I’d like because some of the vocals sounded so “fake”. Take “Games Without Frontiers”, for example. A song that always soared live, it kicked into action well – until we got to Gabriel’s heavily reverbed vocals. Is it possible they sounded like that on stage? Maybe, but I doubt it; I’ve been to hundreds of concerts – and have seen scores of concert videos – without encountering vocals that sound this way. The issue made it tough for me to rate the quality of the soundtrack. Again, on the surface, it sounded great, as it showed good clarity and a dynamic tone. The instruments remained crisp and vivid during the concert with warm low-end. But it just sounded “wrong” too much of the time. I went with a “B” just because the quality was so good that I didn’t think a lower grade would be right, but if the track had seemed more “real”, it would’ve been an “A”. The canned feel didn’t ruin the show for me, but it ensured I’d not enjoy it as much as I would’ve if it’d consistently boasted actual live vocals. When we shift to extras, we encounter a performance from opening act Youssou N’Dour. We get his complete 41-minute, 44-second set, presented with the same picture/audio quality as Gabriel’s section of the evening. Indeed, if you simply choose “Play Show” from the main menu, it’ll run N’Dour’s segment and follow up with Gabriel’s. I appreciate the inclusion of N’Dour’s set; it adds value to the disc. The Blu-ray ends with the classic ”Sledgehammer” music video. Presented with DTS-HD MA 5.1 sound, this memorable video looks and sounds quite good here. Speaking of videos, this release packs the entire Play DVD from 2004. That disc includes 23 videos over Gabriel’s career; I discuss it in detail via this link. Other than as a way to save space, it’s useful for those of us who already own the DVD, but it doesn’t appear to add to the Blu-ray’s retail price, so I view it as a nice “free” bonus. Finally, we get a booklet. It includes credits, photos and liner notes from Nige Tassell. Note that the booklet also includes text for Play. One of rock’s all-time great live performers, we get a good feel for Peter Gabriel via Live in Athens 1987. Presented in a clean, concise manner, we find a nice representation of a strong concert. The Blu-ray offers very good visuals and bonus materials; audio suffers from some apparently re-recorded vocals but still sounds strong. Despite some sonic qualms, I find more than enough to like here to recommend Athens.